05:39 pm - Grandparents Galore! A rare occasion: Ollie's grandparents on both sides (+ one great-Grandpa Bob) in one place at the same time. 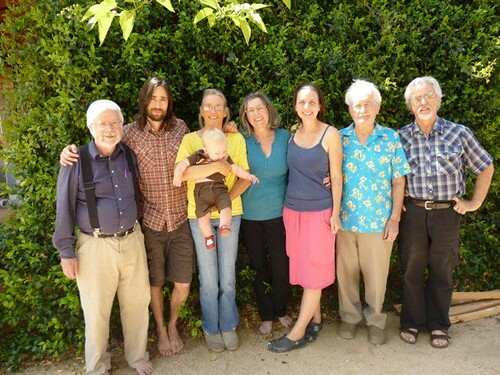 Maya's mom and dad have been visiting Joshua Tree from Vancouver this past week. Here assembled (+ Damian and Maya and Ollie) are this proud and happy "older generation". That picture will be more and more priceless as the years go on.I need to think more of doing generational shots when we are together as a family. Yeah, I have one 4 generation picture of my family that I really treasure.